Bear Claw Bungalow #379 is an adorable single story mountain cabin located close to the Village area and a short walk to the shores of Big Bear Lake. Providing the essentials for a great vacation, this fully furnished home offers a beautiful front deck with privacy fencing and an outdoor 2 person corner hot tub plus a charcoal BBQ and flat off-street parking is available for your use. The basic but equipped kitchen includes the essentials needed for meals, basic appliances including a dishwasher, and a cute dining table and counter bar seating are available for your meals. There is a relaxed and cozy living room that offers comfortable couches, a TV/DVD player for your enjoyment and a toasty wood burning fireplace for those chilly evenings. 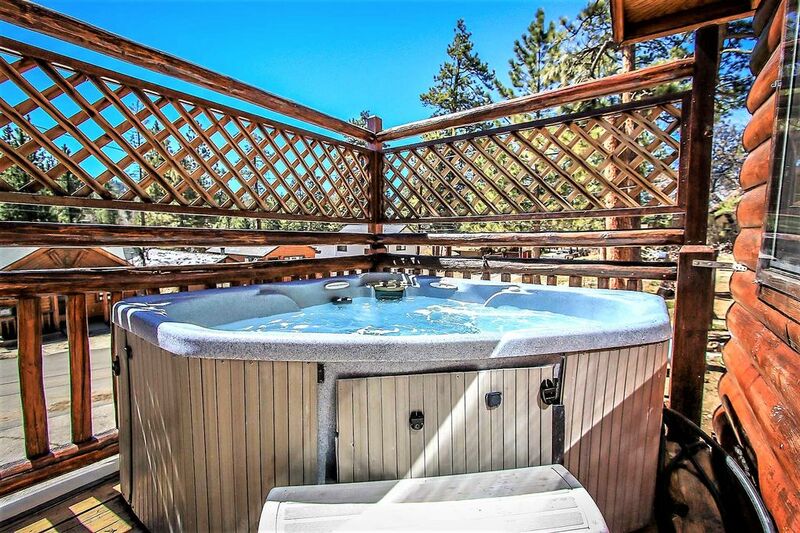 Bear Claw Bungalow has it all offering the essentials plus added amenities, and a great location in a serene mountain setting, making this home a wonderful choice for your next Big Bear vacation! Thank you Daniel! Our team is so happy to hear that you enjoyed your stay and our team is looking forward to hosting you here again soon! Great little weekend escape in a cute little cabin! My husband and I were joined by my father and stepmom for a cute little weekend away in the snow. The hot tub was a hit! We also enjoyed making one dinner in the kitchen and spent lots of time by the fireplace- even making S'mores indoors. They had a few used and destroyed kitchen items such as a wine glass and a knife so be aware (but we did let them know)...overall it was nice and clean and cozy and we would totally go back! Yes! Thank you so much for sharing your wonderful review of our property! This is the experience that our Big Bear Vacations Team truly strives for and pride ourselves in being able to provide for our guests. We hope you made some wonderful memories in Big Bear and that you return to stay again many times. Your feedback has been shared with the Team and we are all looking forward to helping you plan your next memorable vacation! Lighting out front is nearly no existent. You practically need a flashlight to get from the parking area to the front porch. Dingy carpet, very old furniture. Sofa and love seat are VERY uncomfortable. No dressers in the bedrooms. Nothing to put your luggage on, so you basically have to work out of a suitcase on the floor. Windows are old and drafty. They did not even supply a trash can or coffee filters for the coffee maker. But the price was inexpensive and the location was nice. Neighborhood was cute and quiet. The whole checking in across town thing was a bit odd. I would rather the keys be available at the property. The cabin itself is quaint, however the insides leave much to be desired. -The igniter in the stove does not light the propane. -There is mold growing on the drywall in the bedrooms. -There is mold growing in the bathroom near the master bathroom tub. -The DVD player remote is missing. We had to make the DVR remote work with the DVD player. -There is an obscure remote that could be for the DVD player but the battery is drained of power. -The master bed is held together with nails, but not well. The framing of the bed is not even put together all the way. -The framing around the doorways seemed to be put together hastily. -There were random ants around the kitchen. -The kitchen being stocked with necessary tools. -The comfort level of the beds. -The comfort level of the couch. Overall we had a good time. After all, it is a place to stay; we just expected better lodgings for the money we paid. The above critiques are merely suggestions for fixes. Thank you for sharing your experience. It sounds like we could have done better! This is certainly not our standard. We appreciate the feedback and have shared it with the Team. You are important! We hope you do come for another visit soon. Big Bear Vacations offers over 350 wonderful Vacation Homes to choose from. Great location to the Village and mountain. Relatively kid-proof on arrival. Appliances are older, make some noise but all function totally fine. TV does not actually work, but we did not need it, just FYI. Water heater works too well, haha, be careful in the shower! Great patio area to enjoy the snow, use the charcoal grill and 2-person hot tub. Would definitely stay here again! I stayed the weekend with my two kids and the cabin was perfect. Very cozy, clean and in a great quiet location. Thank you for being our Guest. We strive for excellence and appreciate the feedback. I am so glad you have a great visit to Big Bear and a happy - smooth experience with Big Bear Vacations. It is our hope that you made some wonderful memories. We are looking forward to your next visit!